German astronaut Thomas Reiter marked was the European Space Agency’s first spacewalker when he worked outside Russia’s Mir space station during the Euromir 95 mission. CAPE CANAVERAL, Fla. - For German astronaut Thomas Reiter, the road to the International Space Station (ISS) has been a long one indeed. As the European Space Agency's (ESA) first long-duration astronaut bound for the ISS, Reiter will launch toward the orbital laboratory Saturday with six NASA astronauts aboard the space shuttle Discovery during the upcoming STS-121 mission. Once aboard the space station, Reiter will join its Expedition 13 crew, culminating five years of training, several crew shuffles and many frustrating delays. "I'm the one who will be left behind on the station," said Reiter, 48, after arriving here at NASA's Kennedy Space Center spaceport Tuesday where Discovery stands poised for launch. "I think we are all confident that our launch will signify the continuation of the assembly of the station, return to a three-man crew, and utilizing the station for its purpose." Reiter's ISS arrival will return to space station back to its earlier three-astronaut crew complement after almost three years of limited, two-person expeditions following NASA's 2003 Columbia tragedy. The STS-121 flight is the second shuttle flight since that accident, which destroyed one NASA orbiter and killed seven astronauts. "It's quite important to have a three-person crew," Reiter said in a preflight interview. "Obviously, one of the most important aspects is the fact that we can dedicate more [time to] scientific research." Reiter will join Expedition 13 commander Pavel Vinogradov and flight engineer Jeffrey Williams aboard the ISS once he begins his orbital mission. The German astronaut has trained alongside the members of Expedition 11, Expedition 12, Expedition 13 and Expedition 14 to prepare for his orbital spaceflight, but NASA's shuttle delays prevented him from joining them earlier. "It's a little sad that I didn't get to fly with the fellows I trained with," Reiter said. "With every Expedition or shuttle crew I was training with, it was almost like an immediate family that I was part of." A military pilot by training, Reiter joined the ESA's astronaut ranks in 1992 and represented the space agency three years later during the 179-day Euromir 95 mission to the Russian space station Mir. He now hopes to spend 175 days aboard the ISS - split across the Expedition 13 and Expedition 14 spaceflights - during his Astolab orbital mission. "We have a little more than 20 scientific experiments, mainly from the area of life sciences, biology, physics, astrophysics and technology," Reiter said of his science mission in a NASA interview. "So we cover a pretty wide band of science." A native of Frankfurt/Main, Germany, Reiter will be his nation's first astronaut to visit the ISS and the first long-duration ISS crewmember who is neither a Russian nor U.S. astronaut. He is also first non-Russian spaceflyer certified to command a Soyuz spacecraft during landing. "People in Germany are very enthusiastic, as people in other European countries are enthusiastic, about human spaceflight," Reiter has said. "I think it's understandable that if one of their fellows is part of the space station crew that this is really something very significant and very interesting for them." 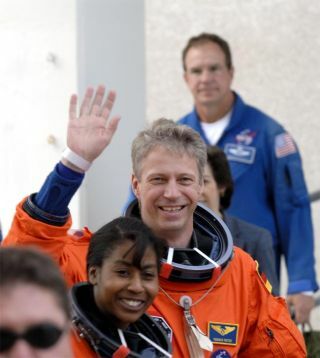 Reiter said his wife is familiar with the risks involved in his coming spaceflight, a result of coping with his previous military flight career. The ESA astronaut also made sure he explained to his wife and two sons exactly how he is trained to perform his mission to boost their confidence along with his own. "My family has prepared a little surprise packet for me," Reiter told reporters this month. "I don't know what's in it, it's already stowed on station." Reiter said he looks forward to seeing the ISS, especially since spaceflight technology has made great strides since his 1995 flight aboard Mir. "From a technical point of view, the International Space Station is much more advanced," he said. "On Mir, we could only communicate with the surface only once per orbit, and every couple of weeks it was very earlier in the morning or late at night. Now we can talk all the phones." ISS telephones allow crewmembers to call friends and family at convenient times, while data from the station's experiments can be saved in a wide variety of ways, explained Reiter. "Whereas we had dedicated black boxes on Mir that could only be used for one experiment, and only that experiment," Reiter said. "So there are a lot of differences and a lot of advancements to Mir." Robert Z. Pearlman, of SPACE.com partner collectSPACE.com, contributed to this story.